Teamwork to get a good look at the basket. 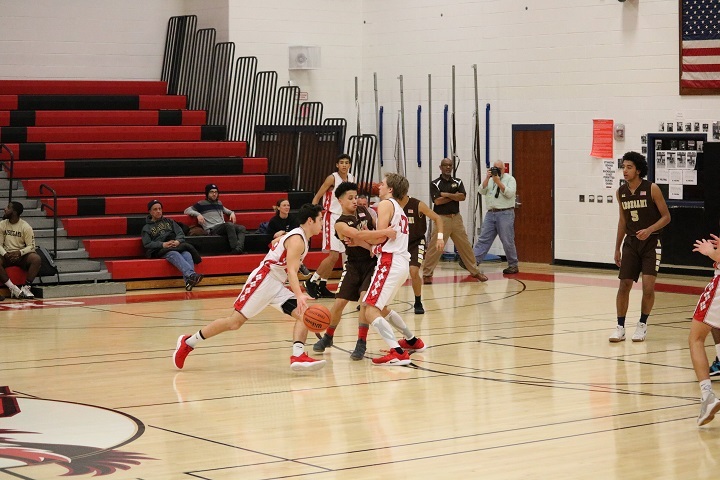 The Ocean City High School Boy’s Basketball team defeated Absegami Wednesday evening at home with a score of 67-43. The win brings Ocean City’s record to15-3 while Absegami drops to 2-15. The starting five for Ocean City were Donovan Graham, Joey Sacco, Luke Varallo, Mike Rhodes and Ian Aungst. Donovan Graham with the jumper. 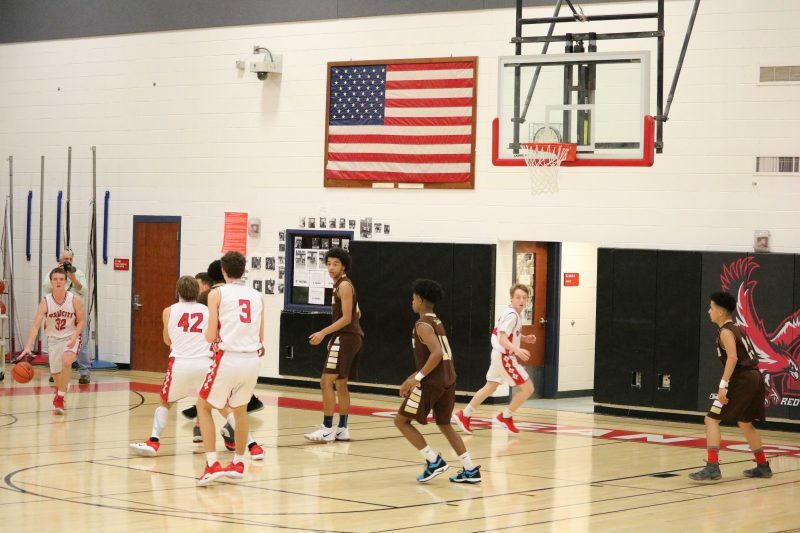 Donovan Graham led all scorers on the evening with 19 points, while teammates Joey Sacco and Will Aungst each scored double digits with 15 and 10 points respectively. 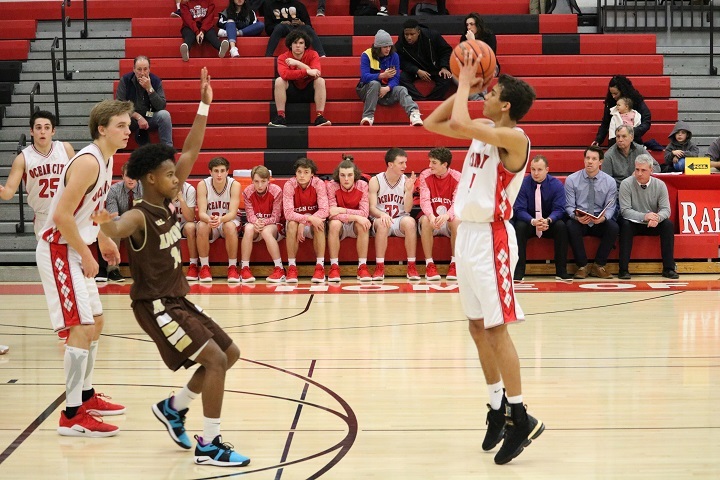 Multiple players off the bench contributed quality minutes through out the entire game and chipped in 14 points for the Red Raiders, including Will Drain with 9 points. 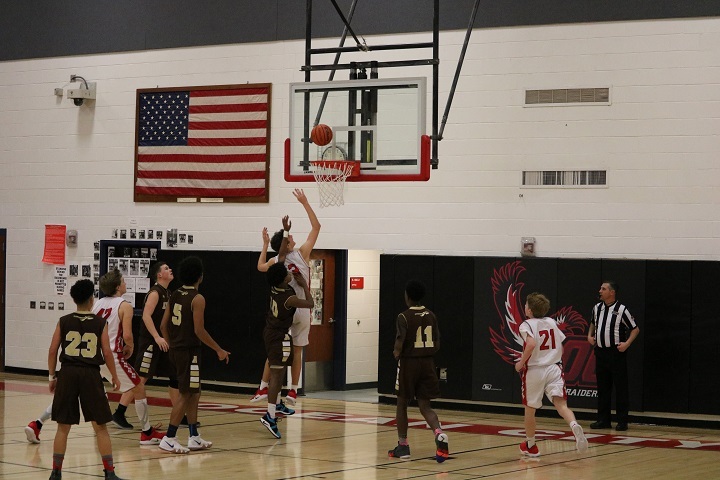 Joey Sacco with the lay up. Despite losing the opening tip, Ocean City dominated the entire game never once losing their lead. Absegami struggled to get into a rhythm offensively while the Red Raiders were sharp from the get-go. Ocean City used good ball movement around the perimeter and nice off ball cuts to find the open player and finish the easy lay up. At the end of the first half, Ocean City held a 20 point lead 33-13. Tom Finnegan with the basket. As the second half of play got underway, Ocean City continued its … from one end of the court to the other. Even with a solid lead, there was no let up in the Red Raiders as they hustled after loose balls and played solid defense to create turnover opportunities. 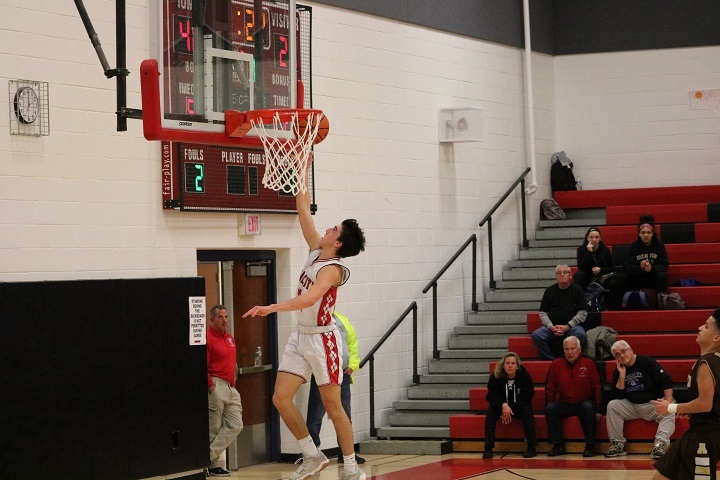 As the third quarter drew to a close, Joey Sacco put up a last second jumper to give the Red Raiders a 30 point lead. Ocean City had it’s highest scoring quarter in the third by putting in 25 points. Will Drain looks for a teammate. As the final eight minutes played out, Absegami put up a good fight, tallying 17 points in the final quarter to Ocean City’s 11. But unfortunately for the Braves, it was too little, too late. The game ended with a final score of 67-43.